Patrick Mackay a British serial killer known as The Psychopath and The Devil's Disciple. Mackay is a suspect in eleven violent murders between 1974 and 1975. He was charged with five murders but only convicted of three. He bragged that he had killed eleven victims. Most of his victims were elderly women who had been stabbed or strangled during robberies. Mackay used an axe to kill at least one of his victims. In 1975, Patrick Mackay was sentenced to life imprisonment. Patrick Mackay was born on September 25th 1952 in England, country in north-west Europe, part of the United Kingdom. Patrick Mackay a male citizen of the United Kingdom. In 1973 (Age 20/21) Patrick Mackay started his killing spree, during his crimes as a serial killer he was known to rob, strangle, mutilate, and murder his victims. He was known to kill at the home of the victim. He was arrested on March 23rd 1975 (Age 22), sentenced to life imprisonment. Patrick Mackay has been listed on Killer.Cloud since November of 2016 and was last updated 5 days ago. The following serial killers were active during the same time span as Patrick Mackay (1973-1975). Patrick David Mackay (born 25 September 1952) is a British serial killer who confessed to murdering 11 people in London and Kent in England, from 1974 to 1975. Q7147073 on www.wikidata.org, Retrieved on Apr 11, 2019. Patrick Mackay on en.wikipedia.org, Retrieved on Apr 11, 2019. Juan Ignacio Blanco, Patrick David MACKAY on murderpedia.org, Retrieved on Apr 11, 2019. Martine Berg Olsen, Forgotten serial killer and UKs longest-serving inmate could soon walk free on metro.co.uk, Retrieved on Apr 11, 2019. 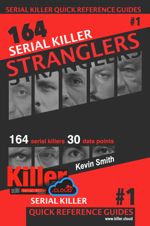 Serial Killers Statistics, charts Patrick Mackay is included in: Serial Killers By Gender, Age of Serial Killer by Date, Killers By Astrological Sign, Active Serial Killers by Year and Statistical Boolean Questions.